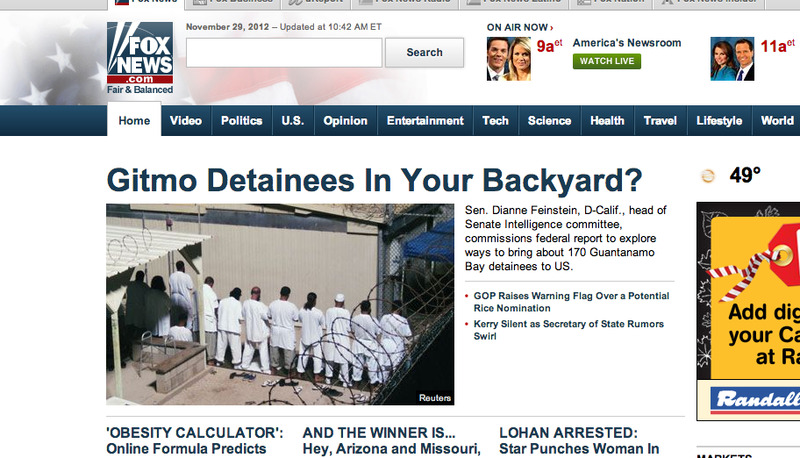 Actual Fox News Headline: "Gitmo Detainees In Your Backyard?" 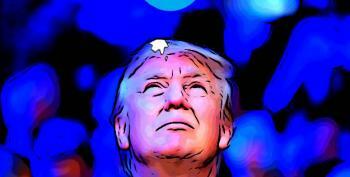 Fox News took a break from their BENGHAZIGATE! and ZOMG FISCALCLIFF!!!! coverage this morning for a little EEEEEK TERRISTS!!! update. The Democratic chairwoman of the Senate Intelligence committee commissioned a federal report to identify prison facilities in the U.S. that are suitable for housing Guantanamo detainees, concluding the option is viable -- despite congressional opposition to such a plan when the Obama administration proposed it. Now, I don't know about you, but I don't think my backyard would be a great place for Gitmo detainees. For one, my kids' playscape is in disrepair. On the other hand, this country has a) lots of prisons; b) lots of military bases; and c) lots of open space. So unless you think these guys have superhuman powers, or just wet the bed at the sight of a Muslim, there's no good reason why we have to keep spending over $100M a year to keep them in Cuba.